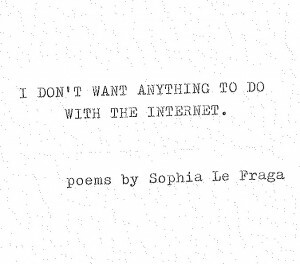 If you accidentally drop Sophia Le Fraga’s I DON’T WANT ANYTHING TO DO WITH THE INTERNET, the book is fucked. This text is unbound, typewritten, looseleaf and there are no page numbers, so one misshap and the whole thing is irrevocably scrambled. Or maybe it is not fucked. The sequencing of these poems is malleable and they do not have to be read chronologically. This “randomness” lends itself to all kinds of questions about the way that we perceive the order of a book of poems. Bound books appear official, permanent, as though there is an art god or a poetry god who said “do it like this” and it was so, and it is so forever. But sequencing is really subjective. If given the chance to rip out the binding and re-shuffle, many poets would likely re-sequence their books shortly after publication. And what about the god of the internet, the @Lord? Is there one? “do me a favor, / professional / consoler: / get outta my sky. / save yourself on a computer / and zoom in on a stranger,” writes Le Fraga. This text is tense, at once resisting and embracing the fleetingness of pop culture and the meme. The speaker is “sick with / sincerity” yet “mass texts” are rendered “a / worse feeling / than hearing / about suicide.” Likewise, “time is a waste of #Poetry” but “RunningOutOfXanax” and “#y’all” and “#Instagram” are immortalized on the printed page. If an electronic god exists, it exists everywhere—irl too. Any attempts to separate the lexicon of the internet from poetry, are futile. The internet is omniscient, a time traveler and in you. Here, Le Fraga employs a transcendental, and mildly paranoic tone, wherein religious ideals are the original screensaver. With skillful linebreaks, she creates a parallel between the computer and the image of eden. Both are hypnotic and can provoke within humans feelings of separation and isolation. Eden creates false distinctions between humans with its inherent notions of original sin and conversion-necessity. The computer, while connecting us quickly and across geography, possesses its own addictive quality and raises the question of just how deep our internet relationships really are. Yet there is also a pervading romanticism in this book—both thematically and structurally. Direct assonance and abba rhyme schemes emerge in various poems, embedded with hashtags, @’s and FourSquare. Le Fraga has a wide command of various forms, but R. Kelly and Facebook often meet structured couplets and tercets. There are yellow #dreamz, the super moon and the loneliness of an unread blog. “at the end of the SNOW / there’s a HOLOGRAM CHAMBER // please / Kickstart / someone // you / love,” she writes. This language is alive and breathing, even when it claws at feelings of boredom and ennui.